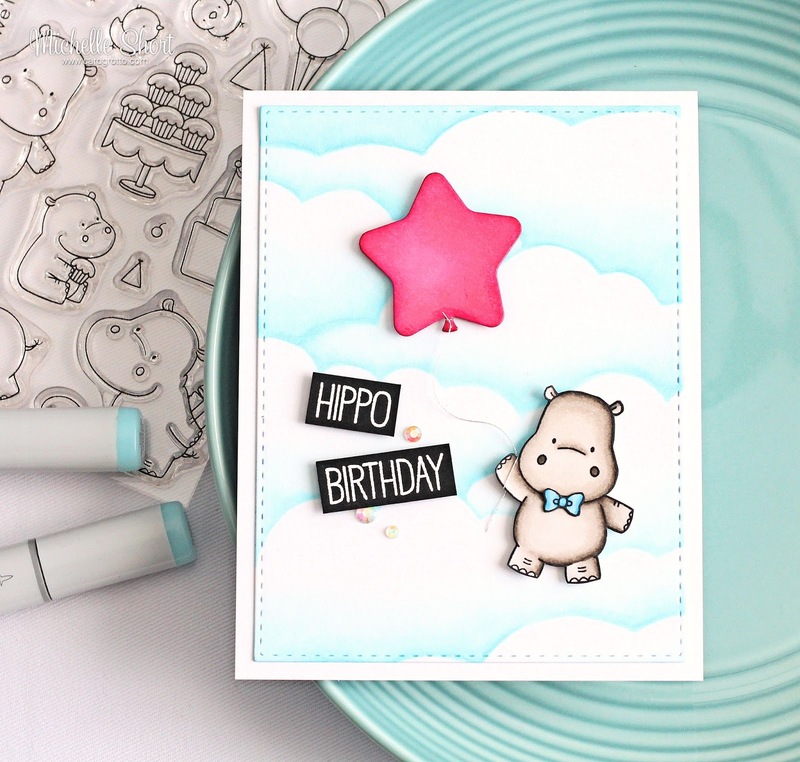 Hello there, today I have a card to share using the super cute Happy Hippos set from MFT. I have been eager to ink up this set since I got it, those hippos are adorable! I started off my card by creating the background. I took a piece of white cardstock and cut it using the largest of the SSS Stitched Rectangle Dies. 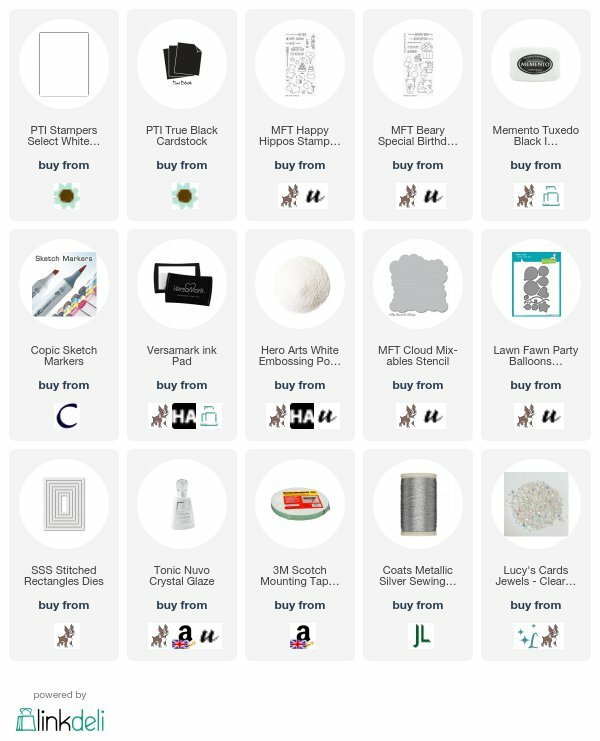 I took the MFT Cloud stencil and used this to create clouds with my Copic Markers. I first outlined the cloud shape with the stencil and then filled in above it with shading, to create the effect I was looking for. I stamped the hippo and bow-tie using Memento Tuxedo Black ink. They were coloured with Copic Markers (colours used listed below the supplies section) and then fussy cut out. I added the bow-tie to the hippo with a little liquid glue. I added the cloud background on to a white A2 card base with ATG. I die cut one of the balloons from the Lawn Fawn Party Balloons die collection and then coloured this with Copic Markers also. I wrapped some silver thread through the bottom and then tied it on to the hippos hand. The pieces were then added to the card with foam tape. 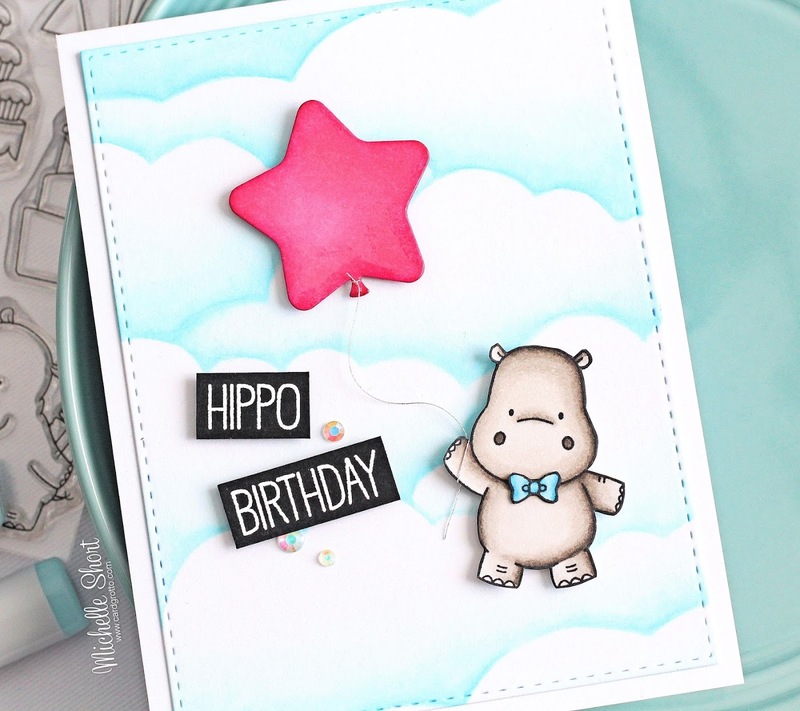 I took the 'hippo' portion of one of the sentiments from the Happy Hippos set and the 'birthday' portion of a sentiment from the MFT Beary Special Birthday set and stamped these on to black cardstock with Versamark Ink. I applied white embossing powder and heat set. These were then cut in to strips and added to the card with more foam tape. I added Tonic Nuvo Crystal Glaze to the balloon and then to finish off, I added a few Clear Iridescent Jewels. COPIC MARKERS: Hippo - W7, W4, W2, W0. Bow-tie - B16, B14, B12. Balloon - RV55, RV52, RV06, YV04, RV02. Cloud - B00, B000, B0000, 0. Thanks so much for visiting me today. I really do appreciate it. I hope you have a great rest of the day and a fabulous weekend! Sweet card...love your cutie pie hippo! I love the background, and that hippo is just so cute!